This post will mark the first in a series of film reviews geared toward teaching the VOTE method of character development. These reviews will not go into in-depth analysis of plot or story execution, but instead will focus on how you can see the VOTE method applied in current and classic films. Each review will look at four principal characters: the protagonist, the chief antagonist, the protagonist's primary “helper”, and a minor character. This analysis will help you see how the VOTE method can be applied to nearly every significant character, which will help you create more realistic and believable characters. 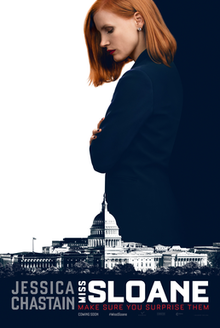 The first film we'll examine is Miss Sloane, a tense political drama written by Johnathan Perera about a hard-driving lobbyist willing to bend the rules for her clients. Please keep in mind that this post will contain some SPOILERS for the movie. V: She wants to ensure enough votes to stop a filibuster on a controversial gun control bill. O: She's facing off against both the “Guardians of the Second Amendment” and her former firm. T: Her tactics range from planting documents to employing private detectives to investigate her colleagues. E: She needs to show that she can win against the most overwhelming odds, regardless of who gets hurt along the way. V: He wants to have enough senators on his side to kill the gun control bill and keep his client happy. O: He has to face off against Sloane and her arsenal of political trickery. T: His tactics range from turning Sloane's former assistant against her to planting a “mole” at her new firm. E: He needs to win over his client and his boss to keep his job. O: She struggles with her past as a victim of gun violence. T: She becomes the (reluctant) face of the gun control bill. E: She needs to recover from her past and feel safe. V: He wants to get Sloane to open up about herself. O: Her reluctance to get close to anyone, along with the nature of his “occupation”. T: He tracks her down at a formal event and tries to start a real conversation. E: He needs to connect with her and show that he's more than just a body she can use. When you write your script, every character should get a VOTE. If you need help applying these methods to your characters, contact me at storyintoscreenplayblog(at)gmail(dot)com, or through the SIS Facebook page.